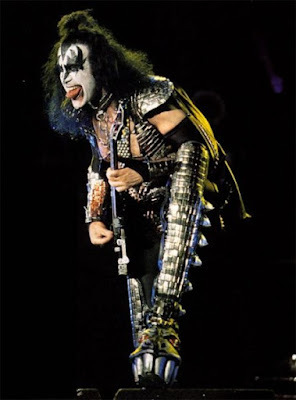 Gene Simmons is hinting that a global KISS farewell event in the next few years will spell the end of the band as they begin to consider plans for retirement. "We're the hardest-working band in show business,” Simmons tells Glasgow Live during the group’s current UK tour. “I wear over forty pounds of studs and armor and all that stuff, seven-inch platform heels, spit fire and have to fly through the air and do all that stuff. "If Bono or Mick Jagger, who we all love, had to dress up and do what I do, they couldn't last an hour – they just couldn't." "In hindsight,” he continued, “it would have been smarter to be a U2 or The Stones, to wear some sneakers and a t-shirt and you're comfortable. No, we had to do it the hard way. "So we're not gonna be able to do it into our 70s, and I'm 67 now. We'll do it for a few more years, and then when we think it's time to go, we'll go, and we'll do it the right way, with a big party. I'd like to think that we would do something that rocks the planet – something big and worldwide and maybe free." Simmons co-founded KISS with Paul Stanley in New York in January of 1973 from the ashes of the pair’s previous band, Wicked Lester. Lead guitarist Ace Frehley and drummer Peter Criss rounded out the band’s original, classic lineup, which was inducted into the Rock And Roll Hall of Fame in 2014. After several changes through the years, guitarist Tommy Thayer now wears Frehley’s makeup and drummer Eric Singer uses Criss’ makeup to perform material from throughout the band’s career.